I continue to receive terrific feedback about my presentation and essay on the rise of the marketing technologist — thank you to everyone who has contributed comments, anecdotes, and ideas. The pent up desire for marketing to take control of its technological destiny is clearly bursting at the seams. Modern marketing is powered by software. Software to plan and design new programs. Software to execute and deliver those programs. Software to measure and optimize everything. This is more than information technology. It is creative, strategic, and brand-defining. Software is redefining marketing’s capabilities. Marketing is now faster and more granular. Marketing is more connected and always on. Marketing is more accountable and efficient. Marketing can even be more useful and engaging. Marketing must master this software. Marketing must build and buy it. Marketing must mix and mash it. Marketing must lead and leverage it. Such leadership cannot be relegated to IT. Such leadership cannot be outsourced. Marketing must control its technological destiny. Marketing must employ its own technologists. 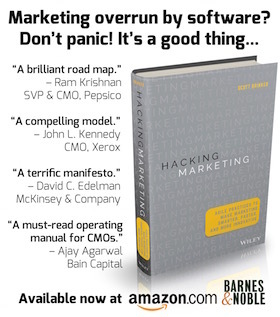 Marketing must have a “marketing CTO” leader. Marketing must tap software and data beyond IT. Marketing must entwine technology in its DNA. Strategy, creative, technology, and innovation. Well done, Scott. This is an excellent summary, and call to action, of your previous work on the Marketing Technologist. Scott, I think it would be much easier to convince people by demonstrating effective marketing models and algorithms based on advanced software engineering: AI, machine learning, statistics, and feedback control. Hi, Mikhail — thanks for the comment! Those are all fascinating technologies that you mention, and I’d love to see examples that you think do a great job of applying them in marketing. I tend to think of them as mechanisms that live deeper in the software itself, and that marketing departments still need to adapt organizationally to manage and govern such software. Mutually compatible themes, to be sure. Hi Scott, I am working now on customers’ segmentation based on a Naive Bayesian classifier and Fuzzy Logic. Other examples are prediction of customers’ behaviors, a highly personalized recommendation engine, statistical analysis of customers’ feedbacks to adapt the marketing campaign in a real-time, etc.